The day after we climbed Pyramide du Tacul the weather was not with us - there was a very strong wind from the west. We were still in the Cosmique hut and thus decided to climb the easy peak Pointe Lachenal (3613 m) which was in the lay side of the wind. 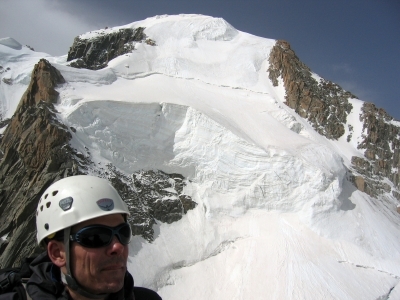 The author on the summit of Pointe Lachenal (3613 m) with a perfect view of the huge hanging glacier of the North Face Triangle of Mont Blanc du Tacul. 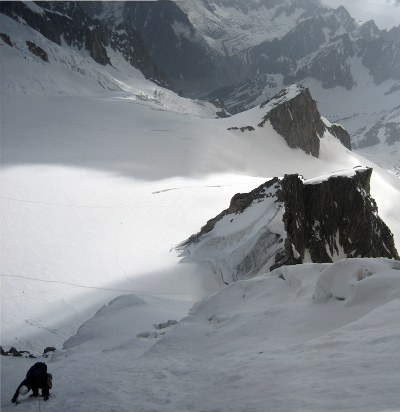 Move the cursor over the picture to see the North (Contamine) Couloir and the first two belays. It was a nice and easy route which gave us an opportunity to spot the next route we wanted to climb: The North (Contamine) Couloir of the North Face Triangle of Mont Blanc du Tacul (350 m, AD-). 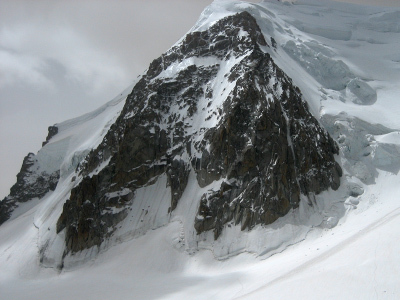 The North Face Triangle of Mont Blanc du Tacul. The next morning the weather had improved so we set out relatively early (5 AM) from the Cosmique hut to get onto the route first and get above the hanging glacier while it was still reasonably cold. We set up a snow anchor before the bergschrund, which I lead. It is rather deep, steep and unprotectable so it is a nice feeling to get on the other side of it! 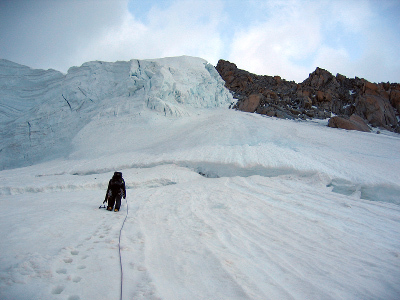 We climbed with a 70 m rope and just managed to get to the first big rock right of the glacier and set up a rock belay. Carsten at the start of the route below the meanly looking overhanging glacier and the rather large bergschrund! Looking back at Carsten as he follows the first pitch. Pointe Lachenal is the first rocky summit seen behind him. It is a spectacular morning! Carsten leads the next pitch going right of the seracs. We are kinda protected from them, but as seen below they are rather big and it is thus a nice feeling to get above them! 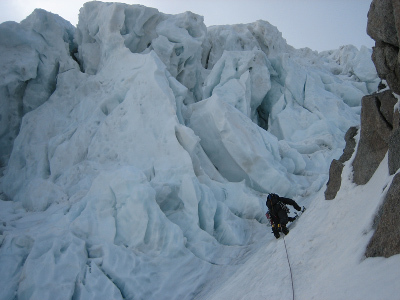 Carsten leading the second pitch right of the seracs of the hanging glacier. Carsten following the third pitch. The ice of the route is very nice and not too steep (average of ~ 50°) with a few steeper sections. We thus decide to pitch the whole route as it is easy to make good belays in the rocks on the right. 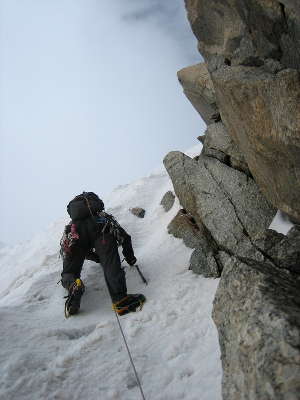 As we get to the top of the triangle we have to make a decision about our descent: rappel or walk-off via the Epaule du Mt. Blanc du Tacul. Carsten climbing one of the steep steps higher on the route. 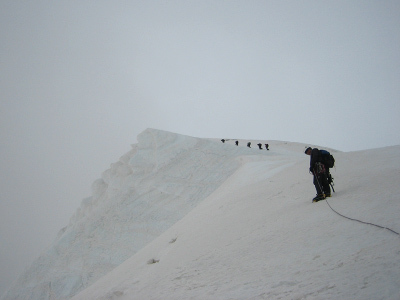 It is getting cloudy on the summit and we don't really know the walk-off so we decide to rappel the route and start to make the first abalakov anchor. However, as we get the second rope out of the backpack two French guides arrive with three clients. 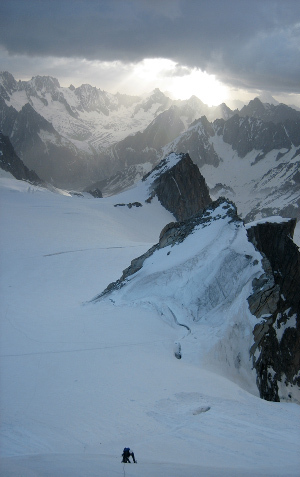 They are (obviously) going to walk-off and we thus quickly get into glacier travel mode and follow them down a not too obvious route negotiating the crevasses and seracs of the Epaule du Mt. Blanc du Tacul. Carsten following the two French guides on the walk-off towards the Epaule du Mt. Blanc du Tacul.